Original version from 1951. Great Jump Blues coverd by J. Burnette, The Yardbirds and many more. His best known recording. MUST HAVE! Tiny Bradshaw led one of the popular R&B dance bands of the late Forties and early Fifties. Besides his own solo hits for Cincinnati-based King records, he was also a regular accom-panist for that label, working with top R&B names like Roy Brown. Born Myron 'Tiny' Bradshaw in Youngstown, Ohio in 1905, he began his musical career as a singer with various New York jazz outfits before forming his own big band in 1934. Towards the close of the Forties he moved into the R&B field and signed with King. During the next few years he had a number of hit records, usually characterized by a firm jump rhythm against a growling sax solo (e.g. 'Sofa A contemporary of Lucky Millinder, Earl Bostic and Bill Dog-gett, Bradshaw toured America coast-to-coast, playing ball-rooms and night clubs. He finally based himself in Chicago, until he suffered two strokes that forced his retirement in the late Fifties. He died in Cincinnati, Ohio, in January 1959. 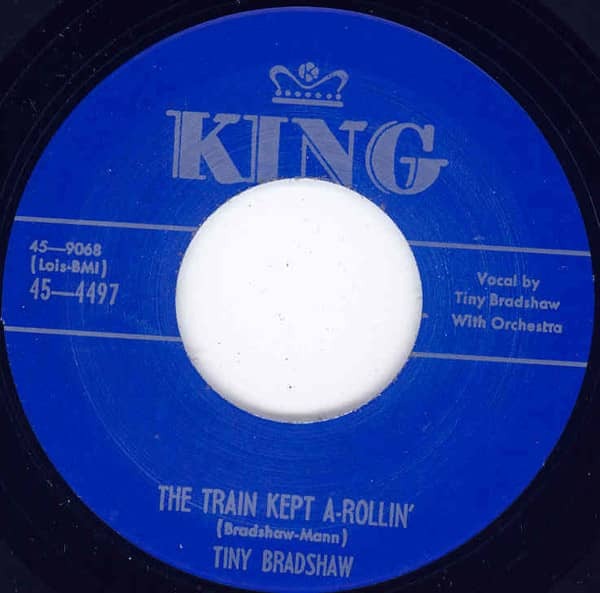 Buddy Holly once cited him as a favourite artist and his song 'The Train Kept A' Rollin" has been much revived. Customer evaluation for "The Train Kept A Rollin' - Knockin' Blues"